Guto’s elegy was composed by Gutun Owain, a poet of noble stock who was active mainly in north-east Wales. More than sixty poems by him are extant, mainly poems of praise and elegies, but also many poems of love and solicitation. The genealogical table below is based on WG1 ‘Iarddur 1; HPF iii: 385–6; GO VIII.17–22; DE 101. The name of Guto’s patron is underlined. 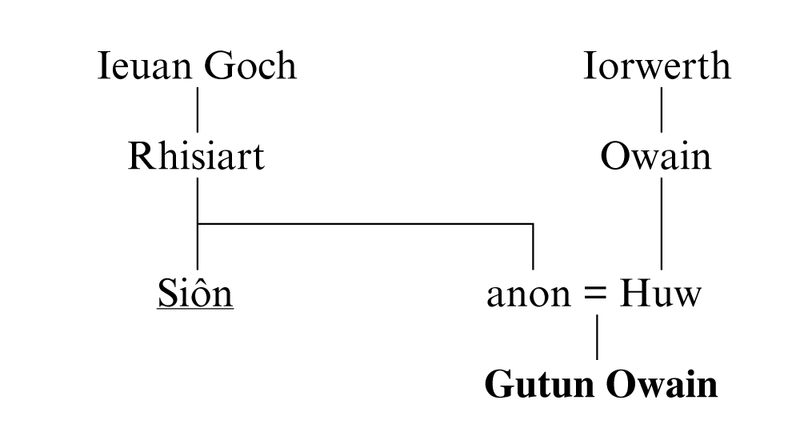 It seems that Gutun was the nephew of Abbot Siôn ap Rhisiart of Valle Crucis. Gutun was associated with parts of the Marches in what is today northern Shropshire, namely the parishes of Dudleston and St Martin’s, and he owned land in the township of Ifton. He was a pupil of Dafydd ab Edmwnd and was present with his bardic teacher in the Carmarthen eisteddfod c.1451, when Dafydd, along with other poets, sought to give new order to fifteenth-century poetical practices. This new order was subsequently incorporated by Gutun into his copies of the bardic grammar. His main patrons were the abbots of Valle Crucis, Abbot Siôn ap Rhisiart and Abbot Dafydd ab Ieuan, but he also received patronage from other gentlemen who were Guto’s patrons. Although not as good a poet as Guto, Gutun’s muse was nonetheless refined and meditative, and his poems of solicitation are notably vivid. As well as being an expert on all things poetic, he was also highly knowledgeable in other fields of cultural learning, such as genealogy, heraldry, religious texts, chronicles and Bruts, and his interests were varied and widespread. It seems that he died before the turn of the sixteenth century and was buried in St Martin’s. See further DNB Online s.n. Gutun Owain; GO; Williams 1997; WB Online s.n. Gutun Owain.